Tags: C77, Hori-ZUN, Japan, Merchandise, ohisama. For anyone going to Comiket 77, make sure to visit the Walfas/ddiction booth on December 30th (Day 2) East District ス[Su]-23b! 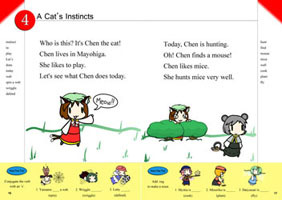 There will be these full-color 32-page textbooks on sale, featuring Touhou’s stage 1-2 characters! Learn English, yeah! 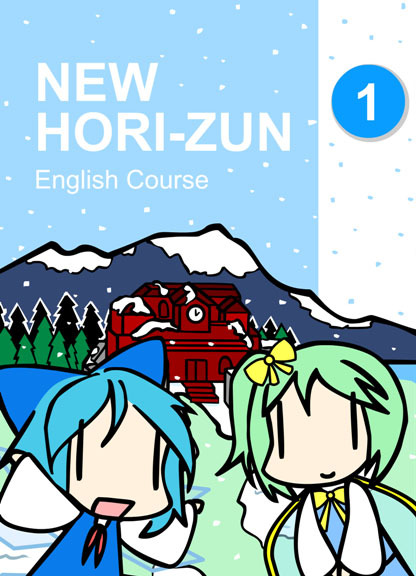 The title is a parody of the New Horizon textbooks. The idea and all the writing and stuff was done by NForza (who you can still buy folders from, by the way! ), and I did the artwork. Above is a preview of the cover and two of the pages! Also special thanks to おひさま (Ohisama, who also did some fanart back in May 2008) for helping out at an earlier Marisa-themed event (that I never actually mentioned on here because I forgot about it until I realized it was already over)! He helped with a preview version of the textbook, scribbling notes and drawings in the margins and on the pictures as if Marisa were writing in the textbook. This preview version will also be distributed for free at C77 for people who purchase the full book. More information can be found on ddiction.org. Please let me order online <3? Wriggle wriggles… Whew that was hard D:! i want that book, i might help me very well with my engrish :3! Too bad I can’t go to Comiket. Or Japan, for that matter. Hardest thing ever. Only a genius like Cirno could guess that easily. OH MY GOD IT’S NOT BOXING CHEN! @Recupel: Over my dead body. I will try to set aside a few (5-10) to sell to anyone interested after the event, and there’s a chance it will be available on DLsite in the future as well. AAH I WANT ONE SO BAD!! Oh well :D This. Is. Epic. And adorable. Wow, looks pretty awesome! I’d buy one of those textbooks, if I was going to Comiket. As for the next update – I wish for lighting bolt objects. Adding -ing doesn’t strictly turn a verb into a noun; in that context, it’s just the present participle form. But I digress. If I were going to Comiket, I would definitely pick one of these up. Keep being awesome. Man I want to learn english now. SGGK LETTY! YES, you are the greatest Textbook Ever! @Hanzo: Yes, I realized that as well, but it’s too late to fix it. I’ll change it for the next print run. Wow. You just keep doing better and better! That’s pretty cool. @Recupel: Yeah, it might be around that price after shipping. I’ll have more details after the event. This is actually very cute, it reminds me of my children english textbooks. English teachers should use this from now on. Yuyuko is hungry for Hot Pockets. Will be you at the con, Walfkun? Oh, and reserve me a copy! wow!!! congratulation!!! this is really Awesome!!!! @Shance: Nope, I’ll be at home (as in, not Japan)! Talka will be there though, and most likely NForza too. Nope! Chen is the Stage 2 midboss and stage boss of PCB, though she does return in the Extra stage as a midboss. …now ‘boss’ doesn’t look like a word. Anyway, this is highly cute! I certainly wouldn’t mind a copy, and I’m becoming an English major! I wonder what a professor would say if I walked in with a copy of this among the usual textbooks. Thos brought a big smile to my face, in the most positive way possible. I really wish I could get it! This is epic. Are you selling them online? какие-то фишки, еще мне интересно конечно штучка хотел спросить. 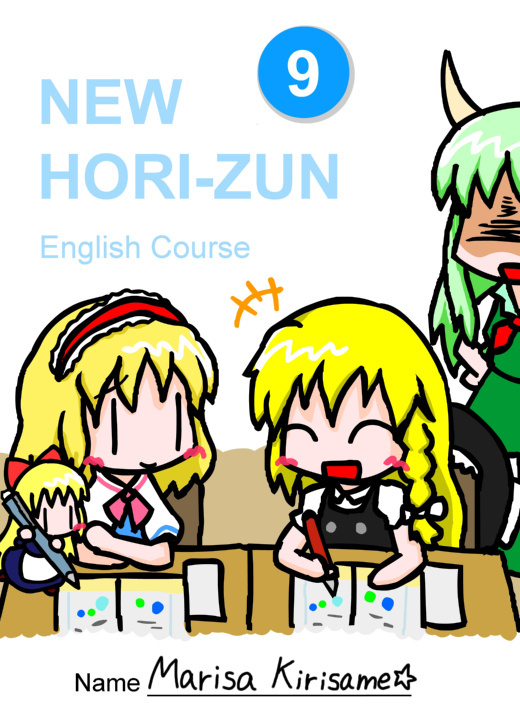 were can you find this new hori-zun comic? oh,and plus can you buy one for free in america in new jersey? IF we had books like this up in canada , I would totally wanna study more !!! …I don’t get WHY sokme of the fanbase are suggesting finding a Japanese variant for me… It wouldn’t even be possible to send unless it’s a series of files.